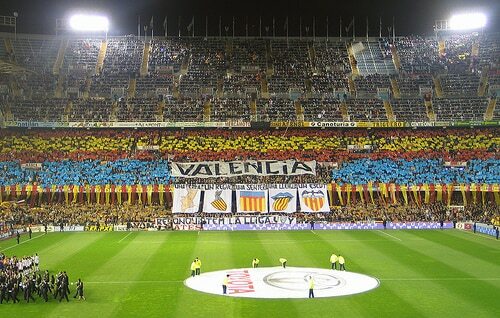 Mestalla Stadium is a football stadium in Valencia, Spain. The stadium is the home ground of Valencia Club de Fútbol. With a capacity of 55,000 seats, it ranks as the fifth-largest stadium in Spain. It is also renowned for its steep terracing and being one of the most intimidating atmospheres in all of Europe in which to play. On 20 May 1923, the Estadio Mestalla was inaugurated with a friendly match that brought Valencia CF and Levante UD face to face (it was valencian derby). During the Civil War the Mestalla was used as a concentration camp and storage warehouse. Mestalla, which in 1925 had held the first match of the Spain national football team in Valencia, was chosen as the perfect setting for the debut of Spain in the 1982 World Cup. Although the performance of the combined national team was did not meet expectations, ten years later the Olympic team would look for support in the Valencian stadium, this time with a very different result, as the young Spanish footballers finally won the gold medal in the 1992 Summer Olympics held in Barcelona. Mestalla has been the setting for important international matches, has held nine cup finals, has also been a temporary home for Levante UD, home of the Spanish national team and exile for Castellón and Real Madrid in the European Cup. 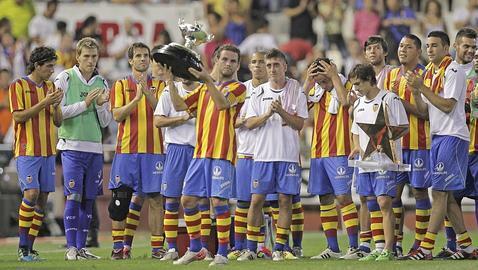 Mestalla hosted the 2011 Copa del Rey Final between FC Barcelona and Real Madrid C.F. on April 20, 2011. Mestalla is very near from Purple Nest Hostel (it´s only 15 min walking).